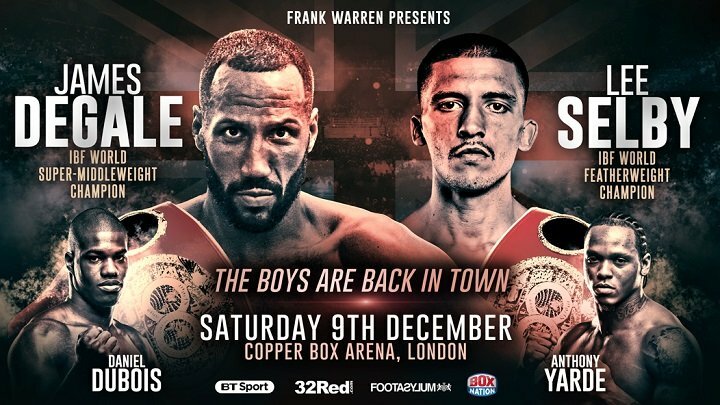 By Allan Fox: IBF super middleweight champion James “Chunky” DeGale (23-1-1, 14 KOs) has revealed his 3-fight plan to return to action following his shoulder injury. For starters, DeGale, 31, will be fighting on December 9 against an opponent still to be determined at the Copper Box Arena in London, UK. DeGale will be defending his IBF super middleweight title in that fight in a voluntary defense. DeGale’s 3-fight plan is a very ambitious one given how bad he looked in his last match against Badou Jack. DeGale took a lot of punishment in that fight, and had some of his front teeth knocked out at one point in the fight. DeGale hasn’t fought since last January in battling to a 12 round draw against former WBC super middleweight champion Badou Jack. If DeGale gets past his December 9 opponent, then he wants to face newly crowned WBC 168 lb. champion David Benavidez in early 2018 in a unification fight. After that, DeGale wants to fight the winner of the World Boxing Super Series (WBSS) tournament. DeGale figures the winner of the World Boxing Super Series tournament will be one of these 3 fighters: Chris Eubank Jr., Callum Smith or George Groves. DeGale is predicting Smith will win the WBSS tourney. ”I’m planning to have three huge fights next year,” said DeGale to the mirror.co.uk. “The main one I want is against the winner of the World Boxing Super Series and it looks like that will be an Englishman in George Groves, Chris Eubank Jr. or Callum Smith. The first fight I want next year is against David Benavidez, the WBC champion,” said DeGale. DeGale is now back with his former promoter Frank Warren, who he started his pro career with in 2008. DeGale had been with Eddie Hearn’s Matchroom Sport promotions, but he opted to go back with Warren. It’ll be interesting to see if DeGale can make some big things happen with his career. Before his fight with Jack last January, DeGale hasn’t been involved in a big fight since his loss to George Groves in 2011. DeGale won 13 fights in a row after his defeat to Groves. The winning streak ended with DeGale’s 12 round draw against Jack, a fight in which a lot of the boxing fans and media believe that Jack should have won. It was a good effort by DeGale in the first 6 rounds, but he definitely faded in the second half of the fight and this enabled Jack to get a draw. DeGale would have to be viewed as the favorite to defeat Benavidez after the way that he looked in winning the vacant WBC super-middleweight title in beating Ronald Gavril on September 8. Benavidez looked very raw in that fight. and seemed to lack the energy that he had in his previous fights. ”Eddie had been in contact, but I felt this was the best option at this point in my career,” said DeGale. Hearn has so many different fighters in his Matchroom Sport stable now. It’s got to be difficult for him to find dates for all of them. Hearn gets excited when he first signs these guys, but obviously doesn’t work out all the time, as we saw with DeGale.